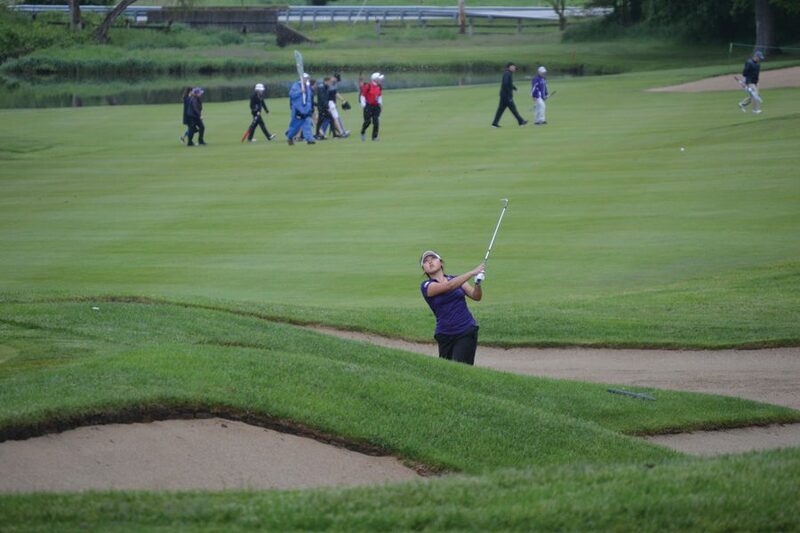 Sarah Cho hits out of a sand trap. Cho will play her final NCAA Regional this weekend in Wisconsin. As Northwestern attempts to qualify for its sixth consecutive NCAA National Championships, the Wildcats will get to enjoy something different about this year’s regional tournament: It’s close to home. Since 2013, the squad has been to regionals in Washington, North Carolina, Georgia and Alabama, but this year, they’ll be just two hours north in Madison, Wisconsin. Of the 18 teams that will be playing the University Ridge Golf Course starting Monday, the top six will qualify for the National Championships following Wednesday’s third and final round. After struggling at the Big Ten Championships in April, No. 11 NU landed in a stacked field that includes No. 4 Duke, No. 5 Southern California, No. 15 Arizona State, No. 22 Illinois and No. 23 Iowa State. The Cats have already played numerous high-level tournaments throughout the year with Duke, USC and Arizona State, and will also be familiar with Big Ten foes Illinois, Purdue, Wisconsin and Ohio State. Most recently at the Big Ten Championships, the Cats finished two strokes behind the Illini, tied with the Buckeyes and just two strokes ahead of the Boilermakers, but they’ll likely need a better performance if they hope to safely qualify for the National Championships. Over the past three years, NU has shown a consistent ability to take its game to the next level during postseason play. In 2015 and 2017, the Cats finished second in their regional tournament; in 2016, they won the regional round, running away with an 18-stroke advantage over second-place Florida State. Junior Janet Mao, then a freshman, won the individual title at that year’s event as well. Mao isn’t the only one with a history of success. Seniors Hannah Kim and Cho have been a part of all three of those stellar postseason showings. Last year, they each had their best individual finishes at regionals, as Cho tied for fifth and Kim tied for eighth. As NU comes off a disappointing fourth place finish at Big Tens, Cho and the Cats will look to bounce back in Madison.